College posters can be more than a photo of your favorite celebrity. Some of the greatest dorm posters are also dorm wall art. What's even better is that dorm essentials like college posters are also cheap dorm supplies! You get to do dorm decorating on a budget and also have great looking dorm wall art! Of course, you're going to want to add some college posters of your favorite celebrity or TV Show, but you're also going to want to mix things up a bit for unique dorm room decor. For a unique dorm room decorations item that will make your college dorm room look pretty cool, look no further than our Dia De Muertos Dorm Poster! This college supplies item has a gorgeous style that will add tons of edgy, artistic flair to your college dorm room. 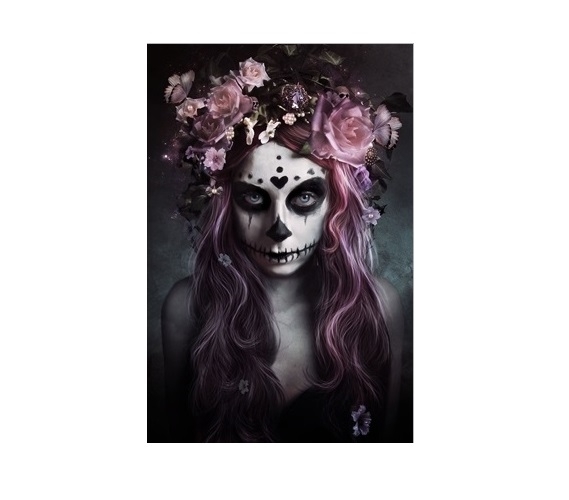 Our Dia De Muertos College Poster features a girl in Dia De Muertos style makeup with flowers in her pink highlighted hair. You can't go wrong with this dorm essentials item in your dorm necessities! The dark tones with pink highlights will blend in with any style of dorm room decor to create awesome looking dorm room decorations. Just because your college dorm room walls are a boring, off white color doesn't mean they have to stay that way! Transform your college dorm room right down to your dorm wall art with our Dia De Muertos College Poster!